Some financial analysts were not caught unaware in 2008 that the Libor rate was being manipulated. WASHINGTON (CNNMoney) -- As the scandal grows over banks that fixed a key bank rate, a few financial analysts and media groups can say they told us so four years ago. Back in April 2008, Citigroup (C, Fortune 500) financial analyst Scott Peng trumpeted in a research note that the "broken" Libor rate -- a key rate used to peg mortgages and other loans around the world -- was artificially low by 0.2 to 0.3 percentage point. "We believe the current liquidity crisis has damaged the interbank market, resulting in Libor sets that at times deviate significantly from real interbank lending rates," said the note from Peng, who is now at SECOR Asset Management. Around the same time, Tim Bond, then a Barclays strategist in London, said on Bloomberg Television that banks routinely gave false submissions for the Libor rate. Bond's interview and Peng's research note were noted in Bloomberg as well as at the Wall Street Journal in 2008. The financial analysts and media all blamed the Libor tinkering on a "prevailing fear of being perceived as a weak hand in this fragile market environment," as Peng wrote in his research note. The idea was that if the public knew how much it really cost the banks to lend to each other during the financial crisis, it would risk making a bank look troubled, which could trigger "dangerous consequences," Peng wrote. What they all missed was that the Libor rate wasn't just getting tinkered with to hide banks' weak balance sheets. At Barclays, staffers had been submitting Libor rates designed to benefit the firm's traders and their trading positions, according to a $450 million settlement Barclays made with U.S. and British regulators. That news has surprised even those who knew Libor wasn't right, said Bond, who's now an investment strategist with Odey Asset Management, in an e-mail to CNNMoney. He said he continues to believe Barclays was one of the "good guys," at least when it came submissions made during the financial crisis. "The prior behavior of manipulating fixings for profit is inexcusable and tarnishes the good behavior during the crisis, when Barclays was more or less risking their reputation to deliver a public good," Bond said. Barclays Capital (BCS) shocked the financial world last month with its Libor admission. CEO Bob Diamond, among top officers, has resigned, and the scandal is threatening to spread to other banks and regulators. U.S. lawmakers care because Libor is used to set interest rates for credit cards and mortgages in the United States. In addition, some U.S. banks, including JPMorgan Chase (JPM, Fortune 500) and Citigroup (C, Fortune 500), are reportedly under investigation. Libor is short for the London Interbank Offered Rate, a measure of the cost of borrowing between banks and a crucial benchmark for interest rates worldwide. It's actually a collection of rates generated for 10 currencies across 15 different time periods, ranging from one day to one year. 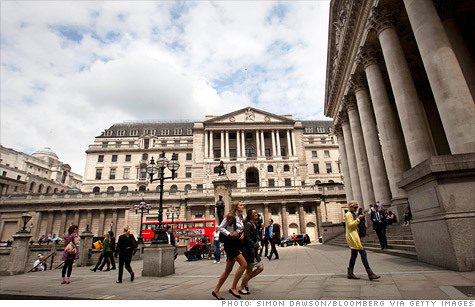 Libor is the world's most important benchmark for interest rates. Roughly $10 trillion in loans -- including credit card rates, car loans, student loans and adjustable-rate mortgages -- as well as some $350 trillion in derivatives are tied to Libor.